Kentucky has been no stranger to tree blights that have nearly wiped out the majestic chestnut and the American elm trees. Now, ash trees are undergoing the same destruction due to the Emerald Ash Borer (EAB) that in the past decade has emerged as a threat. By the end of last year, the EAB had infested ash trees in the eastern half of the Commonwealth, and according to Abraham Nielsen, a Forest Health Specialist with the Frankfort Regional Office of the Department of Forestry, it will impact the rest of the state within four to seven years. The EAB first made its appearance in Michigan, and is suspected to have been brought into the U.S. in packing material from Asia. Across the country, the EAB has already killed millions of ash trees. The small, shiny green beetles then made their way south, spreading into all 50 states. Across the country, the EAB has already killed millions of ash trees. They were first spotted in Kentucky in 2009 and are now in an estimated 81 counties in the state. Once an EAB finds an ash tree, it begins to nibble on the tree leaves. This produces a visual thinning of the leaves that does not affect the health of the tree. From there, the EAB begins to breed. It tucks its eggs under the tree bark and as the larvae hatch, they feed in s-shaped tunnels, destroying necessary tissues that move nutrients and water from the canopy down to the roots. In the spring, male adult borers emerge through D-shaped exit holes. This cycle results in ash trees dying within one to three years of infestation. An ash with damage that is too extensive to treat and must be cut down. An ash with 50 percent damage that can be saved with treatment. Left: An ash with damage that is too extensive to save and Right: An ash that can be saved with treatment. The results of yearly treatments in affected trees can take a few years to show, according to Nielsen. The tree will not appear any worse, and will eventually begin to regain its health and vigor with regular yearly treatments. 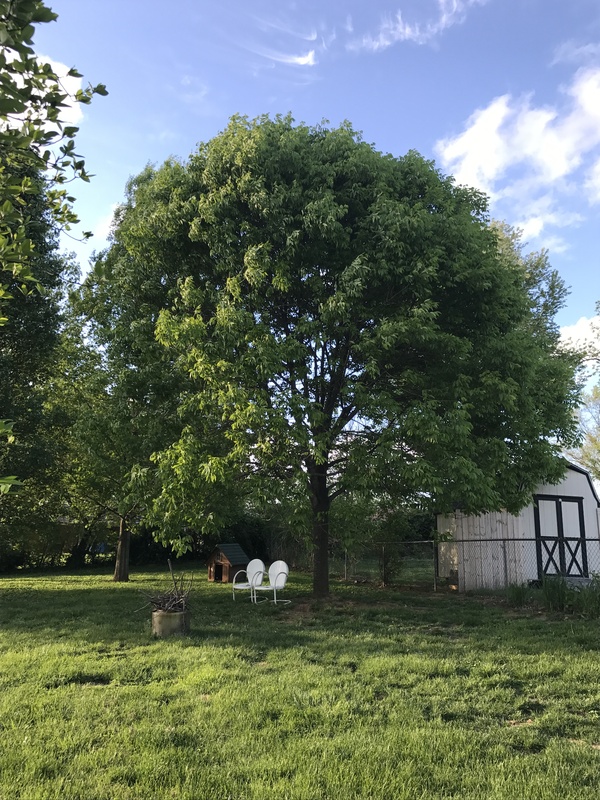 Treating an ash tree is very simple as long as the treatment directions are followed and the soil around the tree is not too wet or too dry. The only time professional help may be needed however, is when the tree trunk is larger than 15 inches in diameter. “When you are dealing with a large tree you may have to call in a professional, which is more expensive, but they have access to commercial chemicals that you or I aren’t able to buy,” Nielsen said. To watch Nielsen treat an ash tree please view the link here for a step by step guide https://www.youtube.com/watch?v=xdETjxxHuus. For more information on the EAB, please visit http://pest.ca.uky.edu/EXT/EAB/welcomeeab.html, which is periodically updated with new information on the spread of the EAB in Kentucky.